To produce cabin mounts for DAF, heavy castings need to be handled automatically through milling, drilling, tapping and deburring processes without human intervention. 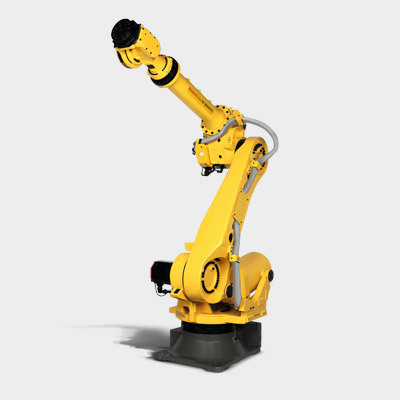 FANUC R-2000iB/165F handling robots equipped with vision and a laser system respectively, view, position and orientate the castings; load and unload them across the machines in the cell. The mountings are processed in one clamping. Streamlined interaction between the robots and machine tools has significantly reduced total machining time and increased cell capacity. In particular, reworking on castings is one of their specialities. This is no easy task for an engineering workshop: casting is not a high precision work and components can display the necessary variations in dimensions. It is important therefore not just to have good arrangements with the foundry about reference dimensions, but also native process knowledge to satisfactorily machine the components. One of the components that are currently being machined in the workshop in Elburg, are special cabin mounts for commercial vehicles by DAF. The castings that are available in left and right hand versions are milled, drilled, tapped and deburred. Maarten Dijkshoorn of the Elburg Engineering Workshop explains that to meet the requirements of DAF, it was necessary to develop a cell that is active 24 hours a day, seven days a week. Robots are being sought after ever more. This is because it is not only cost-efficient in a continuous process, it is also a better solution for health and safety. The mounts weigh quite a lot and though they are the best to lift. The load is in such cases too great for the staff for a manual solution in shift working. Moreover, we could get into trouble with the personnel planning. The machine park and the number of employees is always based on a universal program, so that other projects could become unsettled if we were to put people here from fixed jobs. The castings are brought into the cell on a standard europallet. The left and right versions form together a pair here. The castings are then removed by a FANUC R-2000iB/165F robot, which brings them to a viewing table. This is done by using a magnetic gripper. On the viewing table, not only the precise position and orientation are defined, but also checked if two mounts are actually present. If not, there is intervention. If there are, a second robot - also a FANUC R-2000iB- located amongst three machines and a BTU (drilling tapping unit) , picks them up from the viewing table and places them on a free intermediate position in front of one of the machines. If a machine is free, the same robot places the workpiece in the clamping fixture and waits until one of the machines is ready for the machining. If the machine is ready, the robot unloads it and places the component in the intermediate station, in order to be able to place a new components directly into the empty machine. The machining takes about twenty minutes and thereafter the pause is supposed to be as short as possible. The machine runs again and the earlier machined components is removed taken off from the intermediate station and brought back to a drilling tapping unit. 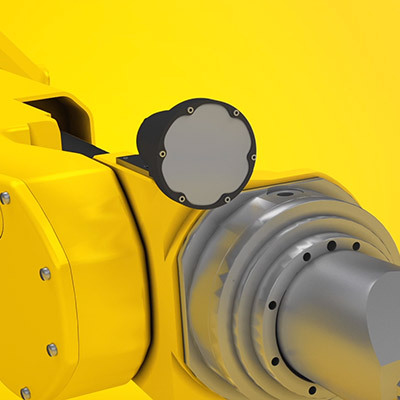 The servo axes of the frilling tapping unit are controlled by the robot itself, so that the BTU in fact functions as an extension (seventh and eighth axis) of the robot. If all processing is executed on the BTU, the robot brings the component to a mounting table. The first robot that is now fitted with a mechanical gripper (the combination magnetic gripper and clamping is not ideal in general) brings over the component to the deburring station. This is in fact nothing more than a motor-mounted steel brush, so that the movement of the robot compensates the wear of the brush. Once deburred, the component is placed on a europallet with the ready product and the whole cycle begins again. "There are many contrivances in the system that make the cell unique", says Stefaan Poppe of Gibas. As robot integrator and supplier of the CNC-machines, he is quite involved in the final design of the cell. "First, there are individual adjustments made to the machines, to be able to manage a decent component size nevertheless, in combination with smart moulds with a relatively small machine. This is done in connection with the economic feasibility of the project. The quality also played a role: We wanted to process the cabin mountings in one clamping. In the extension of it, it is important how the robots and the machines interact. By allowing drilling tapping operations using a BTU unit to take place outside the machines; the Elburg Engineering Workshop could get rid of the four axis CNC, which naturally provides an economic advantage. It also has a positive influence on the total machining time and the capacity of the cell; we could decrease the throughput time from 37 minutes to 20, by optimising the entire process. Finally, some notable vision successes have also been achieved. So, in spite of a difficult industrial environment and a burdensome dull product, with a lot of nuances, we have nevertheless managed to have the robots working smoothly together. We equipped the first robot with vision and the second with a laser sensor, so even in case the vision system does not see, a workpiece is still detected. It is sometimes important to keep the handling time as short as possible. In this case, the focus was mainly on continuity, quality and reliability. The automotive sector always places high requirements on the suppliers. Having been able to satisfy these requirements, the Elburg Engineering Workshop is pleased with the high level of co-operation existing between Gibas and itself. Dijkshoorn: We involved Gibas already at an early stage to design this project from the ground up. This is a method that has already yielded fruits several times. The big advantage is that we have the process knowledge in-house, we know the complex castings and are engaged in developing the correct moulds, while Gibas is not only a robot integrator, but also a turnkey supplier of CNC machines. They can adapt them to our requirements and can have all of them communicate mutually without any problems. Poppe adds: "In our sector, where we often come across similar projects, you cannot work in a traditional client-supplier relationship. You must develop new concepts and anticipate changes in the market. So a smaller cell was first developed for the production of a smaller number of cabin mounts. But since we were still busy with the expansion, the question was escalated from DAF such that we decided to adapt the cell. Whereas the initial design was made with two machines and one robot, now it has become three machines with two robots. You can only implement such quick changes if you are well-tuned to each other. Dijkschoorn emphasises in conclusion that early involvement in the industry is important to get the orders in. "We sometimes develop together, building on certain concepts so if an inquiry comes, we can make an offer very promptly. That way, you have an advantage over the competition Quick switching is the key not to miss the boat. The requirement for this however that you are acting on the basis of the partnership and share the risks of the invested time. Asked whether the use of robots also makes the process more flexible, Poppe seems to have reservations. "Naturally, the robot is flexible, but in the case of turnkey mass production projects, a lot of time and money are invested in the engineering of a solution for one specific product. The main advantage is that you can make it run fully automatically. It must run smoothly and be easy for the operator. This is by the way one of the reasons that we mostly choose robots from FANUC. They are known in the market for their reliability and user friendliness. But that does not mitigate the fact that when you wish to make another product in the cell, you have to incur the engineering costs again. I am therefore inclined to call it a kind of strict robotisation where - when the product to be produced is phased out - you can use the (same) robot for a new project. They had too little to do and have a lot many running hours left in them. The servo-axes of the drilling and tapping unit are controlled as seventh and eighth axes of the robot. The cabin mounts are offered in pairs on a europallet. The pairs (left and right) remain together during production. The deburring position of the robot is adjusted to the wear of the steel brush. The production cell for the cabin mounts for DAF consists of three four-axis CNC machines and two FANUC R-2000iB/165F robots.